September 8, 2017: In the face of increased repression and racism, we show massive opposition to the war on our communities and stand united against fascism and state violence. August 2017: Alameda County Board of Supervisors reject an Urban Shield vendor over their racist products. The Alameda County Task Force meets to decide on recommendations to the Board of Supervisors and the fate of Urban Shield. With strong pressure from Coalition members and the community and heated debate with police and sheriff department representatives, the Task Force arranged for an additional final meeting September 22nd. Ben Bartlett, Berkeley City Council member who is running for state office, changes his stance on Urban Shield to strongly oppose it. 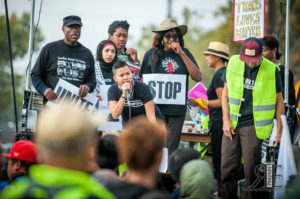 City officials continue to crack down on activists and antifascist protesters – treating us as enemy combatants – using the same logic of Urban Shield. June 2017: After months of mobilizing to Berkeley City Council meetings, Berkeley holds a special session on Urban Shield. We brought a packed house and five hours of diverse and powerful community voices speaking against Urban Shield. Despite this, the Mayor rushed and confused an undemocratic vote to stay in Urban Shield. And when the community took nonviolent action to protest the vote, the police responded with aggressive use of force. March 2017: San Francisco Board of Supervisors condemn Urban Shield, passing a resolution that urges Alameda County to suspend the training. Furthermore, Supervisor Yee states his intention to introduce an ordinance to pull SF personnel and agencies from participating in Urban Shield. January 2017: In response to community mobilization at the Alameda County Board of Supervisors meeting, the Supervisors initiate a County Task Force on Urban Shield to evaluate the effectiveness of Urban Shield and impact on the community. October 2016: San Francisco Supervisors call on Alameda Board of Supervisors to end Urban Shield funding. September 2016: We successfully mobilized and actively disrupted the Urban Shield weapons expo in Pleasanton. With more than 500 people, we showed a strong and powerful community resistance. 2015: Stop Urban Shield Coalition grows to include over 2 dozen endorsing organizations. 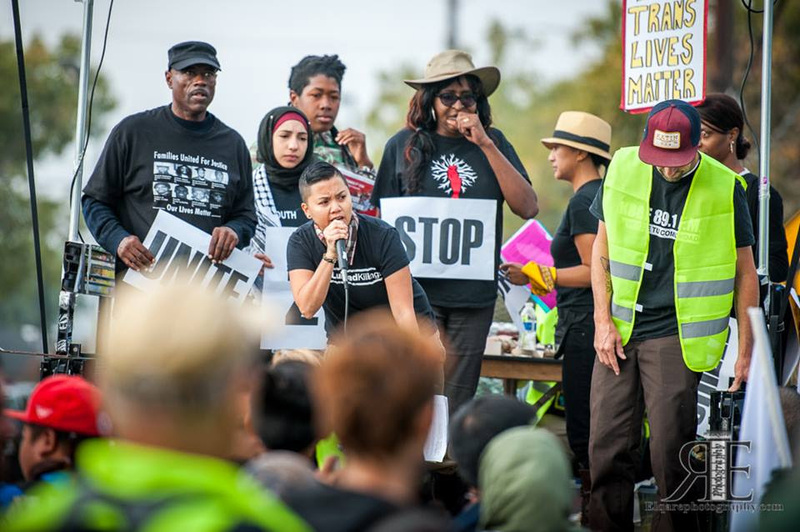 2014: Strong community organizing and resistance forced the City of Oakland to stop hosting Urban Shield. The Sheriff has since moved the weapons expo to the Pleasanton Fairgrounds.